Bake Double Chocolate Biscuits, smear tempered ice cream onto a warm, split biscuit, provide chocolate sauce for dipping, don yoga pants and insert Game of Thrones DVD. What? That's not what this picture is saying to you? Too bad, that's what we did at my house and it was an evening to remember! (Not all household members are partial to yoga pants - that was me). I settled for Ben and Jerry's Cherry Garcia as my ice cream of choice. Which isn't really settling at all and was the best thing available at the gas station for this quickly put together dessert. If I was planning ahead I would use the Toasted Coconut Gelato from Gelato Fiasco, my favorite gelato of all time, hands down. And it's in the next town over in Brunswick, Maine! If you ever have a chance to visit their lovely store be prepared to be overwhelmed. I can never decide. 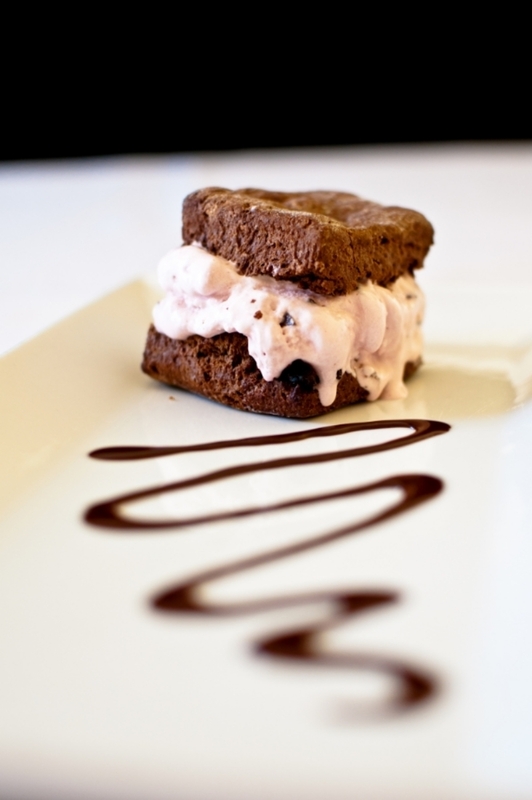 Grab a pint on your way out and hoard for your next Double Chocolate Ice Cream Sandwich night in.